This book analyses managerial responses and people management strategies and processes adopted to deal with the challenges imposed by the Global Financial Crisis (GFC). It examines how key actors in the system exercised strategic choices in a given strategic environment, as well as how they responded and developed strategies in this globally integrated industry, in an emerging market context. The book focuses on the nature of strategic choices available to firms in the Indian information technology (IT) and knowledge and business process outsourcing (K and BPO) industry. 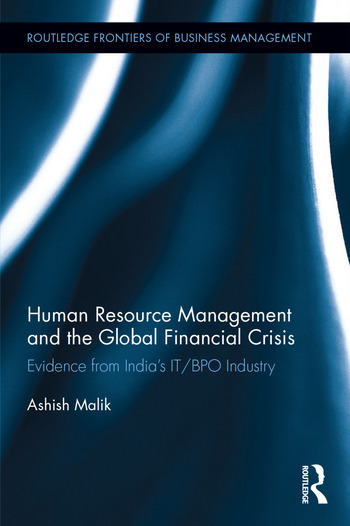 It looks at how these Indian firms in the IT industry exercise their strategic choices to deal with their routine business and how these routines were changed through learning and investment in certain HR and management practices in times of crisis. Additional insights from other national and industry contexts are also provided for wider coverage of how the GFC-affected organisations frame their responses to deal with it. The book examines the changes in the human resource processes and how organisations adjust their operant business models to deal with the pressures brought about by the crisis. Ashish Malik is a senior lecturer at University of Newcastle, Australia, and his research interests are at the intersection of human capital formation, innovation and people management in knowledge intensive industries (e.g. IT, healthcare, pharmaceuticals and telecom), in particular on emerging markets such as India. He has co-authored and co-edited four research books, and his work has appeared in high-ranking academic journals such as Knowledge Management Research Practice, International Journal of Human Resource Management, International Journal of Manpower, Industrial Marketing Management, Journal of International Management, Organizational Dynamics, Social Identities and Healthcare Management Review.